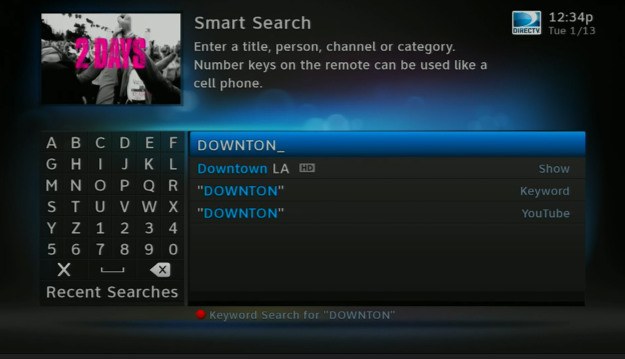 If you’ve used DIRECTV’s “Smart Search” you’ve probably noticed that once you put in enough letters you are presented with the choice of a “keyword” search. You might have also noticed that you can press the red button to get a keyword search, as you see above. This of course led you to scratch your head, I’m sure, and ask what a keyword search was, and why it’s so special that it has to appear on the screen all the time. DIRECTV’s search wasn’t always as smart as it was, and while the smartness of the search has made a keyword search a little less important, it’s still a critical part of finding what you’re looking for. A regular search just looks at the title of the show. The image above shows Smart Search the way it looked a few years ago. I was searching for Downton Abbey. The problem is that the show is actually called Masterpiece Classic because it’s an ongoing PBS anthology show that includes several programs, not just Downton. That’s where a keyword search comes in. A keyword search looks not only at the name of the show but also the title of the episode, the description, the category… everything about the show. If I pushed that red button for a keyword search (or selected the keyword search as my choice) it would have found Downton Abbey faster than Thomas Barrow can light a cigarette. Why not use keyword searches all the time? They’re slower than regular searches. Regular searches update in near real time… as you type the searches show up just as they would in Google or another search engine. A keyword search takes more time to execute. There’s a time for a keyword search and a time for a regular search, so you have the option of both. You’ll find the absolute best results come from using the free DIRECTV app for tablets and smartphones. It’s a lot easier to search for what you want using your phone’s keyboard and you get more results shown in a single screen. You can see that the keyword option is still there, too. 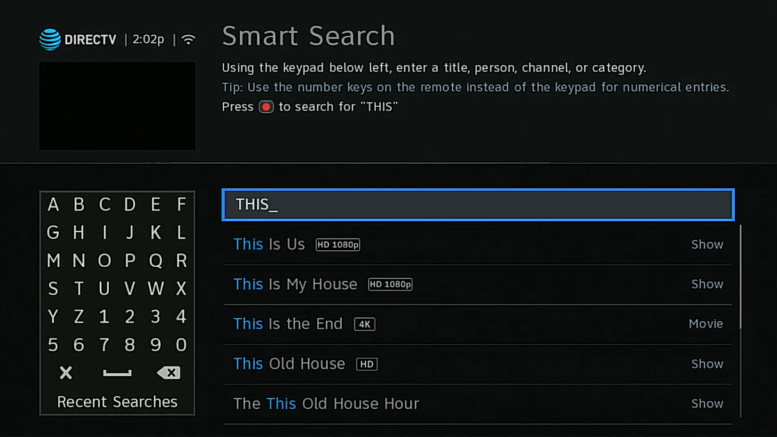 Once you’ve found what you’re looking for, you can easily set up recordings on your internet-connected DVR. 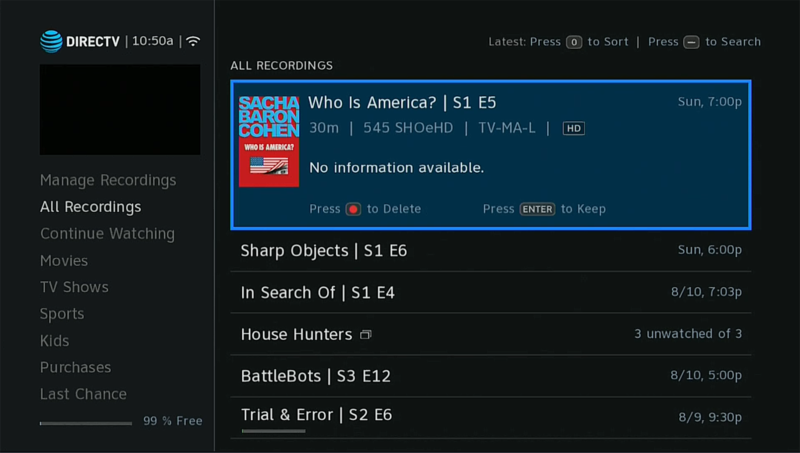 You can choose an individual episode to record or record an entire series. It’s incredibly easy and it’s a lot faster than trying to use your remote to enter one letter at a time. Not only that, but you don’t have to wait until you get home. When a friend tells you that you really ought to be watching The Conners, you can search for it, set it to record, and if an episode has aired, even watch on your phone right then and there. Worried that the recording didn’t take? Press the LIST button on your remote and arrow over and up to “Manage Recordings.” From there you can look at the to-do list and check to see that the recording is there. When you set a recording from your phone they say it can take 15 minutes or so for it to show up, but honestly I’ve never had it take more than 15 or 20 seconds. It tells you that you are connected. The same trick works on the new Genie menus if you really want, but you have to press DASH-DASH to get it. If you’re looking to upgrade from that old equipment to something newer, give us a call at 877.312.4547. Our upgrade specialists will help you figure out what you can get and even what discounts you are eligible for.